Believing he's a girl trapped in a boy's body since childhood, Parinya Charoenphol (affectionately known as Nong Toom in Thailand) sets out to master the most masculine and lethal sport of Muay Thai (Thai boxing) to earn a living and to achieve his ultimate goal of total femininity. Touching, funny and packed with breathtaking Thai kickboxing sequences, BEAUTIFUL BOXER traces Nong Toom's childhood, teenage life as a traveling monk and grueling days in boxing camps. Shot in 9 provinces across Thailand and in Tokyo, the film also features a series of explosive matches where Nong Toom knocks out most of his opponents in Thailand and Japan. Directed and produced by Ekachai Uekrongtham, the film stars Asanee Suwan, a real-life kickboxing champ as Nong Toom. The role earned him the 2004 Supannahongsa Award (Thailand's equivalent to the Oscar) for "Best Actor". BEAUTIFUL BOXER also features compelling performances by Thailand's award-winning actor Sorapong Chatree in the role of Nong Toom's coach and former Miss Thailand Orn-Anong Panyawong as Nong Toom's mother. 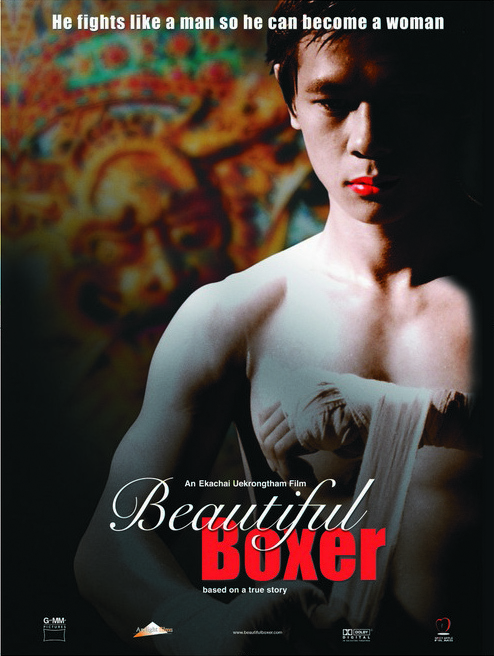 Beautiful Boxer was officially selected for the Panorama section of the 2004 Berlin International Film Festival. It was only Thai film in the 2004 Panorama.